Respectfully, its always said that experience pays and it's not in doubt that experience teaches man a lot in life, and the lessons therein, improve society. 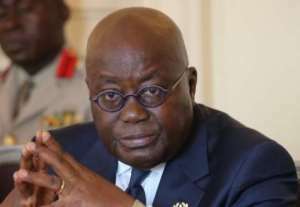 President Akufo Addo had earlier on, called for a dialogue between the two major political parties, the opposition National Democratic Congress (NDC) and the governing New Patriotic Party (NPP) to begin discussions as to the way forward in dealing with this canker. However, as the two main parties have shown public disinterest in starting a meeting, the President has hinted that, he has ordered for a legislation to deal with the matter, and from the look of things, the President is simply saying that as a nation, we need a Statute to end this phenomenon and same Dr. Spio Garbrah believes, by his action before the law Court. However, it's refreshing at this point to note that, Dr. Spio Garbrah had much earlier taken this move, of suing some public entities including the Attorney General, who has since filed conditional appearance for the State in the matter, hoping to take a preliminary objection against the institution of the action. Subsequently, it cannot be overemphasized that, the Attorney General as the Principal Legal Officer of the State has briefed the Head of State about Dr. Spio Garbrah's suit, and the President taking a cue from the intended action and what pronouncement and consequences thereof, that could emanate from the Judiciary, has no option than to give the order first, before the Judiciary gives the order for the Executive Presidency to obey. And obviously, President Akufo Addo is smarter than that politically and wouldn't want that fact to occur, so the President would rather give the order for legislation on the matter before a Court so orders. And we need not forget that constitutionally, the President has the power and obligation to do so, for nation security. g. A declaration that these masked armed men used Police SWAT vehicles for the perpetration of their intended violent operation, a sign to the public that besides their strange presence, citizens should assume them to be from the SWAT wing of the Ghana Police Service, and which violence thereafter caused brutalities and injuries to innocent citizens. i. A declaration that the 4th Defendant Attorney General is constitutionally mandated to present appropriate bills on behalf of the State and accordingly, an Order directed at the Attorney General to present a bill to Parliament within 90 days after this order has been made, for the passage of an Act to deal with political vigilantism in our body politics before election 2020.
j. Cost for bringing this action including Lawyer's Fees. k. And any other order(s) this Honourable Court may deem fit. It's clear from these reliefs above that Dr. Spio Garbrah had looked at the issues carefully and asked the Court of Ghana to intervene on certain critical grounds. And very interestingly, his relief (i), is that which President Akufo Addo has taken a cue from, and has moved swiftly, to block any such possible order from the court so directed at the Executive Presidency, and which the Executive cannot disobey a judicial pronouncement. Thus clearly, Dr. Spio Garbrah as a public spirited citizen has by this legal action, impacted on the Executive to pay homage to the public quest, and it comes as no surprise to Dr. Spio Garbrah and his lawyers why, the Attorney General initially filed 'conditional appearance' to the suit. And when a party files conditional appearance, it presents that the party has an initial objection to the suit and same objection must be brought up for determination before the case can proceed, Thus, with President Akufo Addo's declaration, the Attorney General is clearly coming to court now, to present that the Court dismisses the case on relief (i), as the President has already kick started what the Plaintiff is seeking in that relief. The Justice Emile Short Commission couldn't have made the President make such a quick declaration, the Commission can only recommend. However, Dr. Spio Garbrah's insightful reliefs before the law Court, is giving the Executive Arm of government some amount of headache, no doubt. And it's so because when the Court makes some orders upon these reliefs, they would have to be obeyed by the Executive Presidency and to avoid that, the current declaration by the President must come, so as to arrest any possible order on such tangent from the Court, which could not be disobeyed. However, one aspect of relief (i), which the President's declaration has not arrested yet, is the ultimatum of 90 days within which the passing of a legislation dealing with political vigilantism, must be put in motion. And it's clear that the President's declaration has no timelines and could be political talk that could drag under needless bureaucracy. However, when a Court so orders with timelines, these timelines are very crucial for the carrying out of Court orders. Accordingly, we wait to see, how this timeline aspect of relief (i), would be legally arrested by the Executive Presidency's smart move, of trying to dodge a possible Court order. Dr. Spio Garbrah as a public servant has served in many areas for national development, and few could be summed up here; Spio Garbrah was appointed Ambassador to the United States by Former President Rawlings in 1994. He served well and built positively on the structures for a solid Ghana – US relations. He was later appointed as Minister for Communications in 1997. He also, doubled as the Ag. Chairman of the National Communications Authority, and during his term, Ghana's communication landscape was positively liberalized. He was also instrumental in the re-introduction of VAT in 1998 as the sector Minister.